Our Christmas double issue of Intercom is out now! On our cover this month we feature an image of the Holy Family, from the Abbey studio’s stained-glass window in Saint Finbarr’s Church, Inchigeela in Cork. In our new issue, our editor sits down with Sister Stan Kennedy, founder of Focus Ireland, on her life and work, and what we can do about the ongoing housing crisis this Christmas. We also place a special focus on Advent and the Christmas season, with features on Catholic culture at Christmas by Father Paul Murphy, a meditation on the Birth of Christ from Frances Hogan, and resources for an Advent service for those who are suffering. We also welcome Reverend Roy Cooper, former President of the Methodist Church of Ireland to reflect on Christian Unity. As we look ahead to next year’s World Meeting of Families, we also welcome Clare Cromie-O’Toole, a mother, who writes on family life as model for peace in the world, and we offer resources for a New Year’s Liturgy for families. All this and more, as well as all our usual prayers, reflections and resources for December and January. Click here to see the full contents page from our Christmas issue. 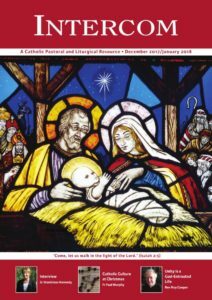 Newsletter, Family Mass and Irish Mass resources for December are available here. There are two ways to subscribe to Intercom. For information on online and digital subscription click here. Alternatively, the membership secretary, Mr Ross Delmar, can be contacted by telephone +353 (0)1 878 8177, by email at ross.delmar@veritas.ie and by post at Veritas House, 7/8 Lower Abbey Street,Dublin 1.